The blog has moved to the address above. The biggest differences are the new design and a more friendly blog for people who don’t know much about (Japanese) MMA. There’s a widget to the right where you can switch between categories, tags, recent comments, post archives, etc. Anyway, no more posts here. The ratings for Dynamite!! 2009 are out and they weren’t what Tanigawa had predicted before the event. The first portion of the card got a 11.8% rating, the second a 16.7%, and the third a 10.6% rating. Not close to the red and white song contest which got 37.1% rating in it’s first portion and a 40.8% rating in it’s second. They did beat the other big program this NYE in comedy show Gaki no Tsukai on Nippon TV by 0.3% though (probably not in average rating though). Definitely not catastrophic. The first part was Koshien + Izumi-Shibata + Takaya-Omigawa + Mach-Gono (only 2nd round) + KID-Kanehara + Tokoro-Kim (the last two fights might have been in the middle, not sure how they sorted them). 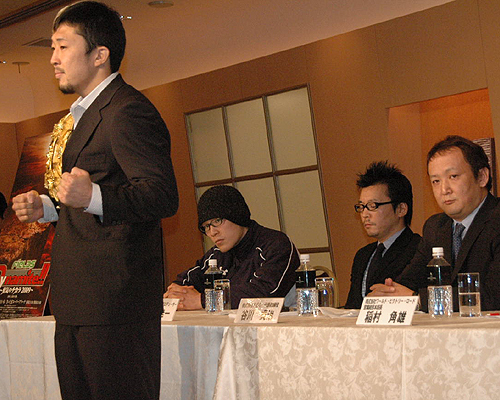 The middle was Ishii-Yoshida + Masato-Souwer (over an hour considering all the PVs and the anthem + fairwell speech). The last part was about 20 minutes long with no PVs, Misaki-Manhoef, Overeem-Fujita, Aoki-Hirota and ending with a replay of the Yoshida-Ishii fight. Kawajiri didn’t even get on the broadcast and Aoki’s fight was at a bad time. Reality check for people who think their fight will be “big”. Also, Kazuo Misaki and his people have appealed for his fight with Manhoef being overturned to a no contest. The refereeing group will answer in two weeks. The biggest event of the year is over and it was very enjoyable. I’m someone who has been impressed with Izumi since his debut fight. His toughness and stand-up skills for someone who has such a build and only trained MMA for a month or so was very impressive in his debut fight (think how Yoon Dong Sik turtled up against Sakuraba). He had another good fight tonight and I was most impressed with how he handled himself when he knocked down Shibata, smoothly going to mount. He won’t ever be a top ranker if he stays in the LHW division with his height, but I think he’s a natural. Very impressive by Omigawa. When the fight was announced I thought it was quite even but leaned towards Omigawa before the fight started. Takaya got dropped by Tokoro and with Omigawa’s head movement and chin I thought Takaya would have a tough night. Very impressive by Gono as well, slick armbar. The stoppages in the Super Hulk final and Misaki/Manhoef were really bad. I understand that it’s on national TV on NYE but that’s very unfair to fighters in such important fights. Great performances by Manhoef and Minowaman though. Tokoro and Kim was one of the most entertaining fights of the night. Not surprising how it turned out. Before the fight I thought Kim could take Tokoro out if he landed, and he almost did in the third. Tokoro’s stand-up was once again impressive though and he was the clear winner. Kawajiri/Yokota went as I thought. Yokota won’t be able to stop Kawajiri’s takedowns, Kawajiri will look more tired the longer the fight goes but will take it clearly in a three rounder. An impressive performance by Kanehara, I didn’t think he would pull it off. I’m a little surprised at the commentators though, first round was either even or Kanehara’s (he actually dropped KID in the round), second Kanehara’s, and third KID’s. Kanehara is tough and hard to finish. He also hits hard which I don’t think people were very aware of before the fight. Nothing surprising in the Overeem/Fujita fight, Overeem is really good right now as most know. Impressive performance by Shinya Aoki. I’m not his biggest fan and didn’t like how he handled himself after the fight but he keeps beating top LWs. I thought the referee in the Ishii/Yoshida fight was horrible, separating the clinch so quickly. He’s always horrible. Ishii looked very bad in the first, in the second he was successful in the clinch, and in the third it looked like his punches had more power behind them than earlier in the fight. He has a chin though and looked good the few seconds the fight was on the floor. Masato went out in style. He didn’t say anything about what his future activities will be after the fight though. FEG’s Tanigawa said after the event that he wants to go forward with a 60 kg K-1 tournament. DREAM EP Sasahara gave Aoki a stern warning after the event for his behavior. He thinks that it’s OK to provoke before a fight but as a pro such things shouldn’t happen when a fight is over. Kawajiri and Yokota also had some heated words before their fight but were very respectful afterward, with Kawajiri saying after the event that he is happy to have defeated a strong fighter like Yokota. As for injuries, Hirota suffered a bone fracture in his right upper-arm, I believe Fujita suffered a strong concussion, and Kim Jong Man and Hiroyuki Takaya received some fracture on their right eyes. It doesn’t look like Yokota got injured from Kawajiri’s armbar. The planned date for the first DREAM event in 2010 is the end of March. Look out for big-shot fighters at Featherweight and Welterweight. Sasahara said that they want to implement a title fight between Aoki and Kawajiri early this year. Minowaman asked Sasahara why there is no belt and prize money for the winner of the Super Hulk Tournament. Kanehara said that there will probably be an SRC event in March and he wants to defend the belt against Omigawa there. We’ll see if there will be any Yoshida Dojo fighters fighting in SRC in the future though. Categories: DREAM: From The Ashes Of PRIDE, Dynamite!! : The Martial Arts Festival, K-1: The Most Legendary Tournament, SRC: Who Is The Raiden Of The 21st Century? #30: Who Got Their Wish Through? Gono announced that if everything goes as planned, we will see a performance on NYE on the same level of the red & white song contest, which is the big TV program on NYE in Japan. A few SENGOKU fights will be available on DREAM’s YouTube channel for a limited period of time. They are high quality and with no commentary. Check them out. On the 21st PANCRASE announced some additional fights for the first big card of their 2010 Passion Tour on February 7th. Previously announced for the card was a Flyweight title fight. As for the newly announced fights, Yuki Kondo will take on Sakuraba pupil and SENGOKU participant Takenori Sato for the interim Middleweight title, KEI Yamamiya will take on Yuji “The Pink Typhoon” Hisamatsu, who drew with Kondo in his last fight, and hard-hitting Seiya Kawahara will have a tough task in front of him against Tashiro Nishiuchi, who is 6-0-4 in his last 10 fights. Also check out the DEEP Cage Impact fights from a few days ago, especially Nobuhiro Obiya vs. ISE (very good) and Masakazu Imanari vs. Justin Cruz. Categories: DREAM: From The Ashes Of PRIDE, Elsewhere: The Battles On The Outside, SRC: Who Is The Raiden Of The 21st Century? The rules for the DREAM vs. SRC fights will be three five minute rounds and no stomps or soccerkicks (taking the bad from both). Referees will be mixed from both organizations. I don’t think the judging is decided yet. Yokota is motivated to fight Kawajiri since Kawajiri is quite a big name now. He thinks that he’d take Kawajiri in a K-1 fight (Yokota has fought in shootboxing, bare-knuckle muay thai, kickboxing, etc. before with good results). Omigawa said that Takaya will be his favorite food on NYE. Both are excited, Omigawa said that because Takaya is the opponent in the “Kusottare Theatre” everything worked out as he desired. He says that they’ll have a violent and good fight on NYE. Takaya shares the same feelings. SRC: Who Is The Raiden Of The 21st Century? Ishii: The Man Who Will Decide The Fate Of Japanese MMA?